Beds: 2 Simple Bed. 2 Double Bed. Equipment: Electric Fan. Toaster. Washing Machine. Television. Microwave. Coffee Maker. Building amenities: Balcony. Colonial Style. The apartment is located in the first floor of a beautiful building of early 20 Century. You reach the first floor by a staircase ornamented in marble. The rooms are very spacious with height ceilings. The house has 5 rooms, one dressing room and a reception hall. Two of these rooms overlook Mexico street, each of them with a balcony that preserves the original structure and oak floors. The master bedroom has a double bed and a large dressing room with a single bed. The second bedroom has natural light coming from the gallery. It has two single beds (can be a double bed). The third bedroom is small and it is reached by a ladder. It has a single bed and toilette. The living room is fully equipped. A wide and glazed gallery connects the rooms to the kitchen and bathroom. The kitchen was recycled. The bathroom has modern design, and is decorated in marble. Furthermore it has a Jacuzzi. If you want authentic atmosphere rather than an antiseptic hotel, then this is what we offer. We had a great time in Buenos Aires and were pleased with the apartment and it\'s location in San Telmo. With record heat we could have used another fan and the stove did not work, but we generally ate out at the excellent places to eat that were nearby. New Years (and other parties) can go all night so bring ear plugs if you will be using the front room and it is summertime unless you will be at the party yourself. Our hosts were helpful in lining.up taxi service, check in and check out and fixing the wireless promptly when the signal was weak. Having a washer in the apartment made it much easier to pack light. We took our young adult children along so being in an apartment was a lot more functional than trying to share a couple of hotel rooms with people on different sleep schedules. 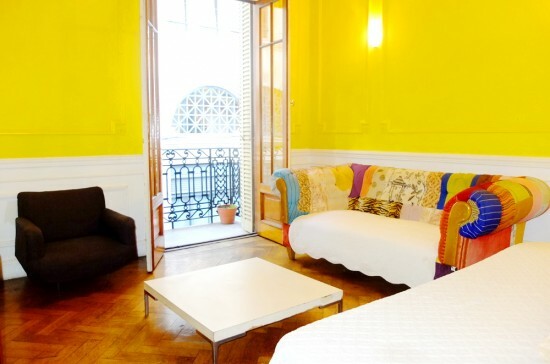 The apt is very nice and well situated in San Telmo. The Mercedes team was very reactive. Just be aware that if you expect to use both bedroom, the one on the street side is very noisy. Anyway we had a great stay in Buenos Aires. A nice little apartment right in the heart of San Telmo, excellent value for the price! There can be some street noise at night and in the morning, but this is normal for the area. If you can't cope with it, don't stay anywhere in San Telmo! Es un departamento muy lindo. Todo funciono bien. La unica desventaja es que el ruido de la calle es muy alto. Pero de todas formas puedo recomendarlo. buen trabajo de los responsables. Very nice apartment with plenty of space. Everything worked fine and the owner was very receptive, accessible and helpful. I will recommend it to anyone who needs a place to stay in Buenos Aires. El departamento está buenísimo, muy bien ubicado, cerca de restaurantes y bares de San Telmo. Cuando vuelva a Buenos Aires me gustaría hospedarme nuevamente ahí. Fuimos muy bien atendidos por el propietario Guillermo y por la administradora Noelia, muy empeñada en ayudarnos en lo necesario. Gracias a todos por la semana que ahí pasamos!! Saludos, Sheila. We chose this apartment because of its proximity to the antiques district of San Telmo. Defensa Avenue is very close to the apartment - in one direction it runs right through San Telmo, in the other it goes up to Plaza de Mayo which gives access to the underground Subte, as well as the central district of town and Florida Road. There is a small shop next to the entrance of the apartment open weekdays for some food and supplies, as well as a small supermarket. This apartment is spacious, and the beds are comfortable (this is an important point)! The neighbours are not noisy, though there is some noise from the street and businesses once the day starts - this one gets used to as part of life in the city. It is somewhat minimally furnished without art or ornament, but if one uses it as a base to see the city, it is adequate enough with wifi and dstv should one be at home. The two bathrooms mentioned in the ad are actually one bathroom and two toilets. This was a downside as the geyser could only accommodate two short showers at a time, and as we were four people, we had to divide up ablutions to two at night and two in the morning. We stayed here for two and half weeks and all in all we had a great holiday. Thank you! My group of four loved this apartment. The area surround his apartment is full of bars and restaurants and is walking distance (20 minutes) to the central Buenos Aires. We had a great time and would rent from Juan again.